NY-ESO-1–reactive TCRs generated from ABabDR4 mice. (A) PBLs from an ABabDR4 mouse immunized with NY-ESO-1116 peptide or NY-ESO-1 DNA were pulsed with NY-ESO-1116 or irrelevant peptide and were stained intracellularly after overnight incubation. The results shown are representative of >10 (Peptide imm.) and 3 (DNA imm.) mice. 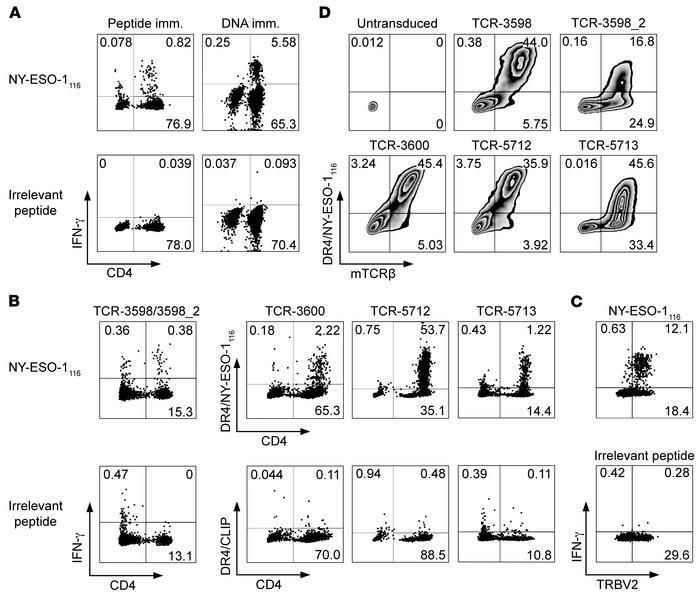 (B) For sorting by flow cytometry, NY-ESO-1–reactive CD4+ T cells were labeled by the IFN-γ capture method following NY-ESO-1116 restimulation (TCR-3598/3598_2) or by DR4/NY-ESO-1116 tetramer staining following a 1-week culture period in the presence of 10–8 M NY-ESO-1116 (TCR-3600 and -5712) or αCD3/CD28 beads (TCR-5713). (C) Splenocytes from an ABabDR4 mouse immunized with NY-ESO-1 DNA were pulsed with NY-ESO-1116 or irrelevant peptide and stained intracellularly after 6 hours of incubation. (D) Human CD4+ T cells were transduced with NY-ESO-1–reactive TCRs isolated from CD4+ T cells shown in B and stained with DR4/NY-ESO-1116 tetramer and for mouse TCRβ constant region (mTCRβ). α and β sequences of NY-ESO-1–reactive TCRs are listed in Table 1. Plotted cells were gated on lymphocytes, live cells, and CD3+ cells (A and B), and CD4+ cells (C and D). Results are representative of 2 independent experiments (C and D). Values represent percentages. See also Supplemental Figure 1.